Update 1: FAQs on Galaxy S4 Air Gesture were added at the bottom of this page. PDF version of all these FAQs can be downloaded from this post. Waving your hand at the Samsung Galaxy S4 to accept calls, change music, or browse the web and your photos? This sounds ridiculous. But it is true. This feature is called Galaxy S4 Air Gesture. Control phone functions without touching the screen! Near the Samsung logo, there is a dedicated sensor to detect the motion of your hand. Galaxy S4 will take some actions corresponding to the motion pattern and current phone state. At this time, only selected (not all) apps can respond to Galaxy S4 Air Gesture. 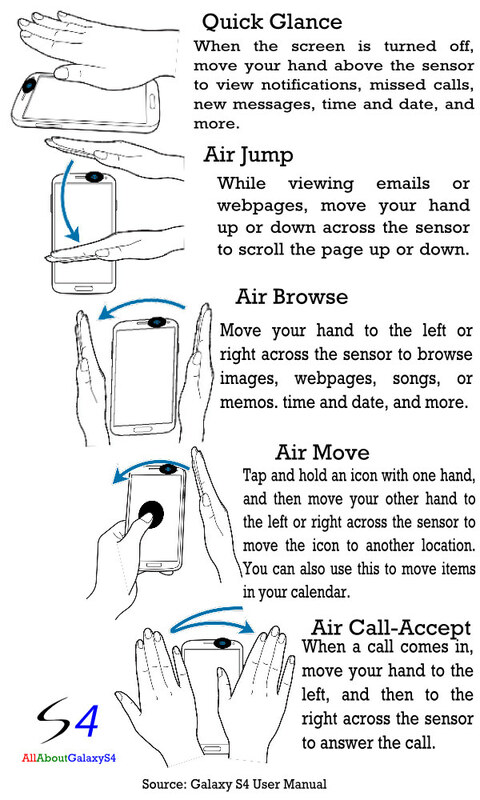 Maybe gradually, more apps can be controlled by these air gestures. Currently, you can use 5 air gestures. When the Galaxy S4 screen is off, move your hand above the sensor to view notifications, missed calls, new messages, time and date, and more. While viewing emails or webpages, move your hand up or down across the sensor to scroll the page up or down. Move your hand to the left or right across the sensor to browse images, webpages, songs, or memos. Tap and hold an icon with one hand, and then move your other hand to the left or right across the sensor to move the icon to another location. While using the daily or weekly calendar, tap and hold an event, and then move your other hand to the left or right to move the event to another day or week. When a call comes in, move your hand to the left, and then to the right across the sensor to answer the call. To use air gesture, you need activate this feature in Galaxy S4. You can do so through Settings– My device — Motions and gestures –Air gesture. Drag it to right to activate it. Q1 : A palm-shaped icon has appeared on the status bar. What is this? You can control your device by making specific gestures with your hand above the sensors via Air gesture. Q2 : The gesture recognition via Air gesture isn’t working well. A : The sensor recognizes gestures best when you make smooth, steady movement about 7cm from the sensor. If you perform them too far from the device or while wearing dark-coloured clothes such as gloves, the device may not recognize your gestures. Q3 : The screen moves up and down. Why is that? Q4 : I find that photos and music skip between “next” and “previous”. Why is that? When air browse are available, you can go to the next or previous item by moving your hand left or right above the sensor in Gallery / Internet / Music Player / Music on lock screen / S memo page view. Q5 : I try to go to the next or previous item in “Music” on the lock screen, but it does not work in my device. What is the problem? A : Please check that “Music” on the lock screen feature in Air browse is turned on. Path : Setting → My device → Motions and gestures → Air gesture → Air browse → Music on lock screen. When you select the “Music on lock screen box”, it will work normally. Q6 : Incoming calls are answered as I go to pick up the device by itself. Why is that? You can accept incoming calls by moving your hand above the sensor. my air gesture sensor not blinking? but all app is working in air gesture are working why? It is normal, as I know. Answer in Air wave your hand to accept or reject calls when you are driving car and feel touch free. Now available in playstore. The only gesture I can get to work is quick glance, the rest wont……… I am following the required movements, is it a fault?? You need make sure your hands move over the sensor as illustrated in the image. Mine is not working at all! I turned everything on what else can I do? Anyway, you can ask the staff in Samsung service center to do a check. my fon doesn’t have settings 4 motion and gestures cause i had formatted it once……what should i do to enable this functions on my fon back…. how should i do that??? can you access Settings– My device — Motions and gesture? Settings>>mydevices>> scroll down..under input and control option you can find motions and gestures. Go in there to activate the settings of air gestures. Also, scroll a bit down and click on Air view option to have more interesting setting enabled on your device.. I have done reset on my phone. There is no gesture icon on my setting My Device Input control. Why do I not have the gesture icon setting on my phone?
. It seems that I am not alone with this problem. did you try Settings– My device — Motions and gesture? Motion and Gesture option in My Device is not present to choose from. Strange ! I am on my second phone (I returned the first within 2 days for the same problem) and the air gestures and motions are not working. The phone has only limited functionality (only quick glance is working) and yes….I have checked and checked again and again in settings, my device, and all of the air gesture and motion settings imaginable to ensure they are all turned on. I got both phones at Costco, so I wonder if it is a lot issue. The first phone had better functionality, as the smart scroll actually worked on it, while this phone literally has little functionality. What is your suggestion? Again, please know that I have gone through all of the trouble shooting tips as well as YouTube videos depicting tips and possible fixes. Nothing has worked. Very frustrated and disappointed. Did you ask the guys in local Samsung service centre to check it? Once you go into Motions and gestures, turn on Air gesture. Then tap Air Gesture to go into more detail. You can then select each feature you want turned on (browsing, call answering, etc). Tap the individual features again to learn how to perform the gesture – you can even try them right there. my phone has no motions and gesture option either. why is that? As I know Air gesture is a standard feature in S4 in all regions. If you do not get it, call local Samsung service centre. I think I have a good answer why motion gesture are not included in all Samsung phone, even if gesture motions are standard in all S4 phones. Samsung have of course quality check of their products before shipping out to the world so all phones must work properly. After little research I found out that are many copies of Samsung S4 on the market which are manufactured parallel in China, and those phones are not true Samsung phones and are limited in functionalities and performance. Watch out if you buy a Samsung S4 phone because all are not what you think. Even if there is a logo of Samsung S4 does not mean any guarantee. A similar example is that you can buy from some dealers brand watches very cheap but they are bad or good copies from the original. Samsung could stop very easy copies of Samsung phones, by a function to check the authority of the phone by cryptically check of the phone hardware and identity. As Samsung are not doing this check for the customers, Samsung are aware that copies of phone will increase their market share and benefit them until the customer will find this out. I live in Ivory Coast and my air gesture does not work when activated tgou how? as long as it works, it should ok.
just at a wave of their hand. It uses Proximity sensor to control all these awesome features. is it possible to ENABLE Air Jump on Apps like Facebook? No, only selected apps are supported. I can’t use any gesture and sensor didn’t recongnize me. Why? Air gesture works with stock apps, not third-party apps. For example, for browser, you have to use Internet; for email, you have to use the email app…. my Samsung Galaxy S4 i9500 doesn’t have Air Gestures Option! even many of other functions like Camera Modes are missing! what should i do? how can i get them back? please help me! There is no Home Screen Mode option too! What the problem can be and how to solve it? In different regions, the location and name may slight different. Anyway, look for Easy mode or Home Screen Mode in your settings. It must be there. Can you tell me why the icon doesn’t appear at the top after turn on the gesture? The home screen mode can be in somewhere other than settings–My Device–Home Scren mode, depending on the region. I did not find the Air Gesture Status Bar Icon in the top of my screen. S4 mini probably does not have this feature. As I know, Samsung haven’t released any API for this. So, it is impossible to extend this feature to other apps or other usages.